This list provides an overview of major reference books. It should be noted that many volumes are out of print or otherwise difficult to purchase (even though we have provided the links to Amazon). However, they are included here because they are still likely to be on local library shelves. Listings are organized from most general reference to more specific references. Reference works applicable to specific instruments can be found on the Instrumental page, and biographies of specific composers/performers can be found on the Biography page. 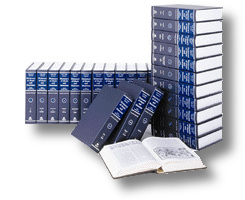 (20-Volume Set). Stanley Sadie (Editor). Norton/Grove. 1980/1995. ISBN 1561591742 (paperback). This edition is the culmination of more than 12 years of work by 2,400 scholars, more than doubling the 10-volume Grove 5. Originally published in 1980 (and often referred to as Grove 6), the 1995 paperback version contains some minor corrections, but many sections are now out of date, particularly those on modern music. See below for the second edition of the New Grove. New Grove II Dictionary of Music & Musicians (29-Volume Set). by John Tyrrell & Stanley Sadie (Editors). Norton/Grove. 2001. ISBN 1561592390 (paperback). This behemoth is the granddaddy of music references covering every type of music, from classical to popular to jazz. Though it is expensive to purchase, it is commonly available in university and larger public libraries. It is an invaluable source of information on musical history, composers, artists, music theory, instruments, musical forms, terms and definitions, musical cities and institutions, and more. The second edition expands the set by an additional nine volumes (totalling over 25,000 pages). This is the single most comprehensive English-language music reference available. Norton/Grove Concise Encyclopedia of Music. Stanley Sadie (Editor), Alison Latham (Editor). W.W. Norton & Company. 1994. ISBN 0393037533 (hardcover). 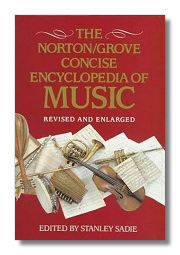 revised and enlarged, The Norton/Grove Concise Encyclopedia of Music presents accurate, up-to-date information under more than 10,000 headings. The entries cover all aspects of music, using material compiled by an international team of scholars. 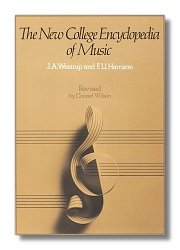 Among the features that make The Norton/Grove Concise Encyclopedia of Musicindispensable for every home and desk are the authoritative biographies of composers and performers, concise explanations of terms, and title listings for hundreds of musical works. A dictionary and one volume biographical dictionary of composers, topics, and performers; no "works" list. Good all-around reference work for beginning classical music enthusiasts. Not very well illustrated but contains clear definitions. Longer articles on major topics by respected musicologists. Shorter entries on bibliography, dictionary terms, biographical information. Huge, excellent, one-volume reference work. The editions 5-8 were edited by Slonimsky. New College Encyclopedia of Music. J. A. Westrup, et al. W.W. Norton & Company. 1981. ISBN 0393000745 (paperback). Common musical terms, some history, some biography, musical examples, line drawings of instruments. Short, clear definitions. Uncluttered. A New Dictionary of Music. Arthur Jacobs. Penguin. 1996. ISBN 014051290X (paperback). This handy paperback gives concise definitions and biographical information. It is highly recommended. New Harvard Dictionary of Music. Don Michael Randel (Editor), with Apel, Willi. Belknap Press, Harvard University. 1986. ISBN 0674615255 (hardcover). One of the standard English reference works, traditionally containing no biographical information. For that, see the companion volume, the Harvard Biographical Dictionary of Music. You will find basic bibliographic material, brief articles, sparse illustrations, no guide to pronunciation. It is a good general music dictionary. Harvard Dictionary of Music. Willi Apel. Harvard University Press. 1969. ISBN 0674375017 (hardcover). Revised version of the classical music dictionary. 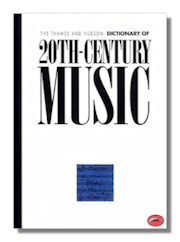 Harvard Concise Dictionary of Music. Don Michael Randel. Harvard University Press. 1978. ISBN 0674374703 (paperback). 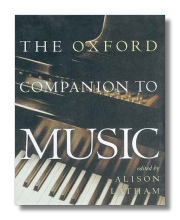 Oxford Companion to Music. Alison Latham. Oxford University Press. 2002. ISBN 0198662122 (hardcover). The Oxford Companion to Music is an essential resource to Western music, completely updated for this brand-new edition. This massive volume-with more than 1,400 pages and 8,000 authoritative entries-is the most complete and up-to-date single-volume reference available in its field. Biographical information on composers and libreticists. Entries on place names, certain opera houses or musical cities associated with performances, performers, musical definitions, brief plot outlines, and performance information. Da Capo Catalog of Classical Music Compositions. Jerzy Chwialkowski. Da Capo Press. 1996. ISBN 030679666X (hardcover), 0306807017 (paperback). This catalog exhaustively lists the works of 132 major composers, from Vivaldi and Bach to Webern and Cage; a classical music lover's dream reference book. It is the only source containing all the essential information about classical compositions within the convenient covers of a single volume. Designed to be "user friendly" for listeners, readers, collectors, and connoisseurs alike, this catalog will show at a glance which works would complete a collection of Mozart's serenades or Dvořák's string quartets. Relying on authoritative sources (many of which are available only in the language of the composer), it is easy to use and hard to put down, and will likely prove to be a vital component of any personal, academic or community library classical music reference shelf. Terminorum Musicae Index Septem Linguis Redactus. Horst Leuchtmann (Editor). Bärenreiter (Foreign Music Publishers). 1980. ISBN 3761805535 (paperback). Polyglot Dictionary of Musical Terms. A serious dictionary for most equivalent terms. Very detailed drawings of orchestral and keyboard instruments, inside and out, with names of parts labeled. Languages: English, German, French, Italian, Spanish, Hungarian, Russian. Musicians' Handbook of Foreign Terms. Christine Ammer. MacMillan (Schirmer). 1971. ISBN 091132061X (hardcover), 0028701003 (paperback). English equivalents of approximately 2700 foreign terms and expression marks for French, German, Italian, Latin, Portugese and Spanish musical scores. Concise. Lists word, language and English meanings but no definitions. Over 10,000 themes indexed and cross-referenced. Directory of Tunes and Musical Themes. Denys Parsons. S. Brown. 1975. ISBN 090474700X (hardcover). Identifies 15,000 vocal and instrumental themes by representing first sixteen notes of each theme by pitch direction. Encyclopedia of Rhythms; Instrumental Forms of Harmony. Joseph Shillinger. Da Capo. 1976. ISBN 0306707829 (hardcover). A massive colllection of rhythm patterns!. Terminology in the Field of Singing. American Academy of Teachers of Singing. G. Schirmer. 1969. ISBN 0028700600 (paperback). This little 26-page booklet is very handy and contains clear, brief explanations of terms. Literature of Bibliography: an Account of the Writings on the History of Music Printing and Publishing. D.W. Krummed. Fallen Leaf Press. 1992. ISBN 0914913212 (hardcover). Chapters on the theory of music bibliography, historical surveys of music printing, technology, graphic art of printing music, commerce and property, national literatures, history of music libraries, collectors, collections, directories and more. 447 pages. New Grove Music Printing and Publishing. D.W. Krummel & Stanley Sadie (Editors). MacMillan Press. 1990 (American Edition). ISBN 0393028097 (hardcover). History of music printing and publishing. Many illustrations. Dictionary of printers, printing terms. Excellent index. 615 pages. This particular edition is out of print. If a recent edition can be found, this is an excellent resource. Catalog of Canadian Music for Orchestra. Canadian Music Centre. National Library ikn Toronto. 1976. (hardcover). Lists over 1000 works by composers who were alive in 1976. Includes concertos and works with chorus and/or solo voice. Performance times, publishers (or manuscript form), premiers. Literature of American Music III. Guy A. Mareo. Scarecrow Press. 1996. ISBN 0810831325 (hardcover). This is a fully annotated bibliography with very pungent and entertaining comments. It lists classical, pop and jazz music. Art Song in the United States 1801-1976. Judith E. Carman, with William K. Gaeddert and Rita M. Resch, with special section by Gordon Myers. National Association of Teachers of Singing. 1976. ISBN 9991602674 (hardcover). The section by Meyers is the Art Song in the United States from 1759-1810. This is an annotated bibliography. Listed by Composer, lyric writer, year, vocal range and voice, song structure, mood, and other special musical comments. Piano accompaniment described (style, doubling, difficulty). Musical Settings of Late Victorian and Modern British Literature: A Catalog. Brian N. S. Gooch, with Thatcher, David S; Long, Odean (Editorial assist.). Garland. 1976. ISBN 0824098818 (hardcover). Musical terms and abbreviations, index of authors, index of composers, copious footnotes. 1112 pages of typeface. This lists literary works that have either inspired or been converted to musical settings. Some delightfully obscure sources are presented. Italian Madrigal and Related Repertories. Harry B. Lincoln. Yale University Press. 1988. ISBN 0300036833 (hardcover). Full title: The Italian Madrigal and Related Repertories: Index to Printed Collections 1500-1600. This huge (1,139 pgs) book contains incipits, annotations, index to first lines, thematic locator index (by melodic sequence and melodic contour), index to sources. New Grove Dictionary of Musical Instruments. Stanley Sadie. Macmillan. 1984. ISBN 0943818052 (hardcover). Many fine illustrations. Bibliographies. Extracted and rewitten articles from the New Grove Dictionary of Music & Musicians with extensive cross-references. 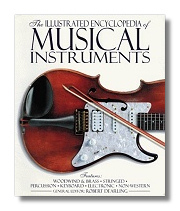 Illustrated Encyclopedia of Musical Instruments of the World. R. Dearling. Macmillan Publishers. 1996. ISBN 0028646673 (hardcover). This extensively illustrated volume follows the evolution of the conventional instrument families – woodwind, brass, strings, percussion, and keyboard – from ancient to modern times. It also offers examples of non-traditional instruments, electronic instruments, ensembles, the "authentic" revival, and non-Western and obsolete instruments. Entries provide background on individual instruments includoing history, use, construction, and associated music/ Also covered are personalities and technologies that have influenced the development of various instruments. Brass Bibliography: Sources on the History, Literature, Pedagogy, Performance, and Acoustics of Brass Instruments. Mark J. Fasman. Indiana University Press. 1990. ISBN 0253321301 (hardcover). Percussion: An Annotated Bibliography. Dieter Bajzek. Metuchen/Scarecrow. 1988. ISBN 0810821079 (hardcover). Emphasis is on listing works with contemporay notation and recently published materials. In English. Percussion Instruments and Their History. James Blades. Bold Strummer Ltd. 1984. ISBN 0933224710 (hardcover), 0933224613 (paperback). This is a Bibliography with an index. It covers a surprising amount of reference material. Catalog of Books and Literary Material Relating to the Flute and Other Musical Instruments. Dayton, C Miller. Reprint Services Corporation. 1935. ISBN 0781206790 (hardcover). This book was privately printed, and now is part of the Library of Congress. The first volume discussed recorders, fifes and simple system transverse flutes in one key. When complete it will cover 6000 instruments in the Dayton Miller Collection. Woodwinds, Brass and Percussion. Allen Bennet Skei. Garland. 1985. ISBN 0824090217 (hardcover). A bibliographic guide for research. Number 458 of the Garland Reference Library of the Humanities Series. American Wind Symphony Commissioning Project. Jeffery, editor Renshaw. Greenwood Press (C.F. Peters). 1991. ISBN 0313281467 (hardcover). Catalog of published editions 1957-1991. Examines 150 commissioned scores, classified and cross indexed by country. Includes biographical information on composers, description of ensembles, durations, score accessibility, photo of the first few measures of each work, structure, difficulty, harmonic, melodic and rhthmic content, special compositional characteristics. This is a good source book for music libraries, conductors and concert program writers. Heritage Encyclopedia of Band Music. William Rehrig, with Bierley, Paul E. (Editor). Integrity Press. 1991. ISBN 0918048087, 0918048125 (vol.3) (hardcover). This Three Volume Set, published by the Robert Hoe Foundation, is arranged by composer, lists known works and bibliography with publisher information if available. The third volume is the supplement plus more complete bibliographies, glossary, complete index. Heritage Encyclopedia of Band Music, Composers and their Music. William H. Rehrig, with Paul E. Bierley. Robert Hoe Foundation – Integrity Press. 1991. ISBN 0918048087 (hardcover). Three volume set. Contains biographies and best known works/works list. Publishers included when known. Apendices: History of band music in America, publishing practices, publishers lists, more. Piano Teacher's Sourcebook. Maurice Hinson. Indiana University Press. 1994. ISBN 0253208858 (paperback). Full title, The Piano Teacher's Sourcebook, an Annotated Bibliography related to Piano and Piano Music. This book is treasure for anyone interested in piano pedagogy. In addition to very helpful annotations, there are exellent indices to authors and composers, and helpful categories. Piano in Chamber Ensembles: An Annotated Guide. Maurice Hinson. Indiana University Press. 1978. ISBN 02533449X (hardcover). A must for the chamber-music lover. Lists every combination including pianos, from duos to octets, and lists piano ensembles for every instrument including tape recorder. Hinson answers these questions: What is there? What is it like? Where can I get it? Covers the period from 1700 to the time of publication. Typical entry gives composer, title, date of composition, good description of the piece and the publisher. 570 pages. Fine index. Makers of the Harpsichord and Clavichord 1440-1840. Donald H. Boalch, with Mould, Charles, ed. Oxford: Clarendon Press. 1995. ISBN 019318429X (hardcover). Lists many makers with full descriptions of instruments, dates, registers, histories, and ownership and brief biographies of makers. The Index of terms in several languages is by Andrew Roth. Dictionary of Pipe Organ Stops. Stevens Irwin. Schirmer. 1983. ISBN 0028711505 (hardcover). Description of over 600 stops, definitions of terms relating to organ, acoustical properties of pipes, and a short bibliography. Universal Dictionary of Violin and Bow Makers. William Henley, with Woodcock, Cyril (Editors). Amati. 1973. ISBN 0685795705 (hardcover). Spanish Guitar. Gerald, J. Bakus. Gothic press. 1977. ISBN 9998348064 (hardcover). Full title of book is The Spanish Guitar: A Comprehensive Reference to the Classical and Flamenco Guitar. This book lists works, composers, performers with a full bibliography and index. A Conductor's Guide to Choral-Orchestral Works. Jonathan D. Green. Scarecrow Press. 1994. ISBN 0810827123 (hardcover). Survey of works with overview in introduction. Lists of biographical material on composers, works, duration of pieces, performing forces of work, text, first performance,editions, notes on performance issues, fine section on text sources. A Conductor's Guide to Choral-Orchestral Works, Twentieth Century, Part II. Jonathan D. Green. Scarecrow Press. 1998. ISBN 081083376X (hardcover). Volume 2 covers the Music of Rachmaninoff Through Penderecki. Chamber Music: Research and Information Guidlines. John H. Baron. Routledge (formerly Garland Press). 1987. ISBN 0824083466 (hardcover). A Bibliography of Computer Music: A Reference for Composers. Sandra L. Tjepkema. University of Iowa Press. 1982. ISBN 0877451109 (hardcover). Bibliography, acronym lists, annotated guide to articles and publications related to diverse aspects of composing with computers. Technical discussion of equipment and programs. Also see the Biography page for biographies on specific composers. 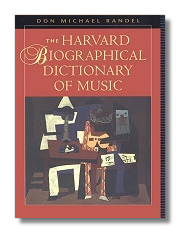 Harvard Biographical Dictionary of Music. Don Michael (ed) Randel. Belknap Press, Harvard. 1996. ISBN 0674372999 (hardcover). This is the companion to the New Harvard Dictionary of Music (which does not carry biographies). There are entries for 5500 musicians, composers, performers, theorists, instrument makers, from classical western art music to jazz. Portable Baker's Biographical Dictionary of Musicians. Nicolas Slonimsky, et al / Paperback. Macmillan Publishers. 1995. ISBN 0028712250 (paperback). Thames and Hudson Encyclopaedia of Twentieth Century Music. Paul Griffiths. Thames and Hudson. 1989. ISBN 0500202354 (paperback). This is a biographical survey of the first two thirds of the 20th Century. See also Griffiths other works on composers of the 20th century (Ligeti, Stravinsky, Boulez, Cage, Bartók). International Who's Who in Music and Musicians. David M. Cummings. Taylor and Frawas. 1994/95. ISBN 0948875712 (hardcover). This is the fourteenth edition. It contains biographies, worldwide orchestra addresses and managers, opera companies with addresses, festivals with contact addresses, music organizations, major competitions and awards, music libraries, music conservatories, and a list of Masters of the King's Music. This is out of date, but still contains interesting information. 1296 pages. Biographies of Celebrated Players and Composers. Philip Bone. Reprint Services Corp. 1988. ISBN 0781207398 (hardcover). 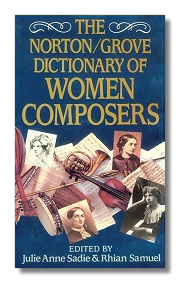 Norton/Grove Dictionary of Women Composers. Julie Anne Sadie (Editor), Rhian Samuel (Editor). W.W. Norton & Company. 1995. ISBN 0393034879 (hardcover). Concert and Opera Singers: A Bibliography of Biographical Materials. Robert H Cowden. Greenwood Press. 1985. ISBN 0313248281 (hardcover). Part of the Greenwood Press Music Reference Collection (# 5). Includes ten reference works in four languages and nine periodicals in five languages, and lists articles and books on singers (collections, individuals), biography, autobiography, pedagogy, interpretation, historical novels and fiction. Arranged chronologically and within major periods of music from beginning (1620-1750), Revolution (1750-1800), Second Awakening to Second New England School (1800-1865), Romantic Classicists (1865-1919), the Twenties, The Time of Trouble: Depression Years (1930-1950), and 1950-1981. Entries on popular and classical musicians and performers. Works List. Encyclopedia of Music in Canada. Helmut Kallmann, with Potvin, Gilles & Winters, Kenneth. University of Toronto Press. 1981. ISBN 0802055095 (hardcover). Huge one-volume biography, bibliography, discography well illustrated with black and white photos and drawings. Very small print. 1076 pages. Contemporary Canadian Composers. Keith MacMillan, with Beckwith, John. Oxford University Press (Canadian Branch). 1975. ISBN 0195402448 (hardcover). Biographies, works lists, and bibliography. Works list arranged by type of composition. 248 pages. British Musical Biography: A Dictionary of Musical Artists, Authors and Composers Born in Britain and its Colonies 1897. James D. Brown, with Stratton, Stephen S. Da Capo. 1971. ISBN 030670076X (hardcover). This is a reprint of the William Reeves 1897 work. 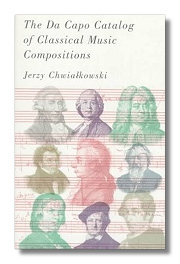 It is a good source for little known composers as well as the more famous ones of that period. 462 pages. Contemporary Hungarian Composers. Laszlo ed. Ginacs. Editio Musica Budapest. 1979. ISBN 9633302757 (hardcover). In English. Biographies and works lists for twentieth century composers from Hungary. Includes Bartók, Farkas, Kodály, Kurtag, Szabo. 22O pages. Illustrated with photographs. A Catalogue of Contemporary Irish Composers. Music Association of Ireland. Music Association of Ireland. 1968. (hardcover). Very brief biographies and good list of works. In Boston Public Library. A Dictionary of American Composers. Neil Butterworth. Garland. 1984. ISBN 0824093119 (hardcover). Classical composers. Good short biographies and works lists, chart of famous teachers and their illustrious pupils. 523 pages.